The truth of our modern times is that you probably won’t find a student who does not use innovative gadgets today. It is also true that students use different mobile applications not only for entertainment, but for studying as well. Both Apple and Android provide dozens of programs and apps for college students that can be very informative and useful if you want to keep up with the times and boost your studying process. Every student probably knows plenty of applications that fit his or her needs most, but there are still some mobile “helpers” no student should live without. We are here to tell you about 25 of them. Millions of people use Any.Do to organize their tasks. This application is perfect for students who need to create a to-do list. It also synchronize all tasks with other devices so that the list can be accessed from anywhere. Add new entries to the list with the help of touch-based interface, or use your voice to create tasks. You can change the priority of your entry, mark a task as completed, or even shake your device to remove all completed tasks from it. The Any.Do widget can be added to your home screen for quick and easy access. Do you often have troubles with your email? Is it frustrating to control your inbox because it lacks features? Then it’s high time to download Inbox to your mobile device and forget about all these problems at once. Built in with different features allowing you to see bundles of similar emails, check off or snooze your reminders from calendar, Inbox allows you to have things done instantly and also get back to old tasks at anytime. No college student will be afraid of losing his notes or coursework anymore! Thanks to Dropbox, you have a chance to upload different files (documents, photos, videos) in the cloud and get them online whenever you need, even if you forget your phone at home. The only thing needed to access your files is an Internet connection. Store your files in Dropbox, and share them with friends without any fear of losing important and useful data. College students always want to know everything and keep their eyes on the ball, but it may be quite difficult to do because of constant deadlines, part-time jobs, overdue essays, exams, etc. Feed.ly is here to help you deal with this problem. This is one of the best RSS aggregators. It lets you consolidate all news into one feed. Just check the news you would like to receive, and get notifications every time something interesting appears. Nothing could be easier, huh? Welcome to the world’s biggest library online! Scribd helps students find millions of different documents and books that are important for your studies. All those data are shared by people from all over the world, and you can easily curate and organize them according to their topic. Create your own library with different notes, texts, and books that you need. Share them with your friends, and find all the information with Scribd. This one is perfect for those students who study literature and write papers on things they’ve read. CliffsNotes will provide you with information about every character, plot, or theme, as well as summaries of every book you read. The audio version is available here, so you can listen to all this info during walks or work to get ready for literature tests. Oh yes, your math homework or tests may be quite challenging. It is so easy to stuck trying to find the right answer. Try Mathway—the mobile application that will guide you step-by-step while you search for algebra, geometry, or any other math solution. Enter your task into the application, and check if your solution is the same with one offered. If you’re a student who uses Apple devices, you will be happy to know that you have access to iTunes U, which gives you access to different educational courses from all leading universities for free! Did you dream of studying at MIT, Oxford, Yale, or Cambridge? This is your chance to do it from your own place: download this amazing app, and learn various subjects from the best colleges and universities in the world. What is the most difficult stage of essay writing? The majority of college students would probably say: creating a list of citations (do not forget that you have to know MLA or APA style to format it). If you are one of these students, EasyBib is the right app for you to download. Just enter a book’s title and get the right citation! All you have to do is copy this citation into your bibliography. How often do you forget about the date and time of your test? Do you always know the deadline of your homework, the time of your next lecture, and the subject of your next class? Thanks to Studious, this problem will be solved once and forever. All you need to do is to enter all information about your class, time, professor, location, etc., and this cool application will remind you about it just in time! This is the perfect application for words enthusiasts and everyone who has to read many books on different topics, where you might come across some tricky words. Dictionary.com makes it easy to find the definition of every word you are not sure about. One small bonus for those students who like spying on their classmates: this application allows them see what words people around are them looking for. This is one more application for your mobile device that will help you understand English words better. It’s easy and quick to use: just enter the needed word into the app, and get its detailed definition at once. Rare words, both with British and American variants, audio pronunciations, all new words—all this will help you understand the English language better, even if it is your native one. College students are so easily distracted from the studying process! They can’t live without social networks, they always need to check new photos of their friends on Facebook, or share their mood with the world during a lecture. To avoid such distractions, the SelfControl application has been created: it blocks certain websites that can distract you from studying, and it does it for a set amount of time. So, when a lecture is finished, you are welcome to come back to your fave websites again! All the famous and most fascinating people are in your phone now! 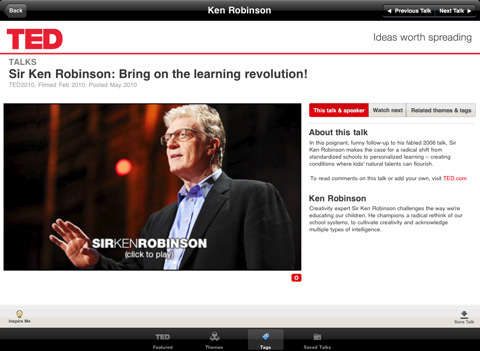 High-quality videos of different conferences from all over the world are waiting for you in TED—an application that has all business experts, educators, computer geniuses, music legends, and many other interesting people in it. Open your mind to something new! The name of this application itself perfectly describes its features and functions. If you are a math student, and you always need a calculator to solve equations quickly, you are welcome to download RealCalc Scientific Calculator. Now you will never be afraid of forgetting your calculator at home (well, you can still forget your phone, but anyway). How often do you use copy and paste buttons while writing your essay for example? Some students simply add a couple of their own thoughts to that copied material, and here it is—a new essay! Sound familiar? Then JumpCut is your savior here: this application saves you a lot of time, giving you access to all texts that you have copied and pasted before, even if a new text has been copied by you again since then. When a new semester comes, and you have to buy many new textbooks to continue your study, do not be in a hurry to sell your soul and spend all your money. Download Chegg, a free application which lets you find rentals of textbooks you need! Just search for a book, and if they have it, put in an order. And when you no longer need a textbook, you can easily rent it again via Chegg. Easy to use and useful to try. Being a college student in 2014 means having a large number of Google Docs (and big chances are, that this number will be much bigger than you could even imagine). It’s logical, that you will need access to all these documents from everywhere; so, the best decision here would be Google Drive application for your mobile device. If you study far away from home, Viber will be your best helper to connect with your family and friends. Free talks and calls let you stay in touch with close people, share all news, photos and videos with them, and feel their presence even when they are not in the same city with you. If you are one of those lucky students who study foreign languages, then you definitely need Duolingo, the application that will help you learn new words, get ready for tests and exams, and complete various tasks to improve your knowledge. It is free to download, and it is available for all users of Apple and Android devices. What could be better than converting any file into a PDF with a single click? College students will definitely like Snap2PDF application which is very useful, though easy to use: just take a picture of a need text, and then convert this picture into a PDF file. Simple like that! How many to-do lists do you have in college? One for essays, another one for exams, the third one for parties… So, why not synchronize them all in order to get access from anywhere? Choose Clear for this goal, an application which syncs all your to-do lists with other devices and makes it easier for you to open them wherever you can find Internet access. Venmo is a free application that links your device with your bank account to make it easier for you to pay back money without having to deal with cash. With its help, you can share your payments with friends, collect money from people who owe it to you, pay your bills, and much more. How many times did you lose your wallet in campus? While you are thinking, we are ready to represent you Lemon Wallet, an application that will help you avoid this unpleasant situation, or find your lost wallet quickly at least. Lemon Wallet brings you an access to identity theft protection, and it will become your most convenient mobile wallet ever. College students often have problems with money. And even if you have enough savings, they always tend to disappear. Do not let this happen, and download Mint.com to control your budget and see what your money is usually spent on. Who knows? Maybe you will become more responsible. Do you have all these cool apps for college students in your mobile device already? Or maybe you can name any other useful applications we’ve forgotten to mention about.